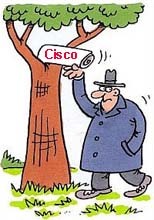 Earlier this month an internal memo to all staff from Cisco CEO John Chambers found its way out onto the world wide web. The news wires were fizzing. A glance at the early reports on Reuters, Bloomberg and the Wall Street Journal indicates that a key element of the story was that it comprised forbidden fruit. This was no corporate press release. This was a leak. Precisely what all Internal Communicators fear most. After all, nothing clips the wings of an Internal Communications team like a leak. Unless of course it is not a leak – but a press release disguised as one. I have no idea if this is the case here. But I can’t help feeling all is not quite as it seems. The full text of the memo was published on Cisco’s own blog very quickly after the leak. I have read it several times now and I must confess that without knowing the guy, John Chambers could certainly get a job in a top PR agency if his current CEO gig doesn’t work out. The language, the structure, the sentiment and above all the lack of clarity around certain key points certainly read like it’s been constructed by someone who knows how to handle a quill and bit of parchment. It reads like it was intended to pave the way for staff to brace themselves for some tough love, while at the same time demonstrate to the outside world that fundamental change was afoot. But actually the content was not particularly newsworthy in its own right. There was no announcement of specific product or organisational changes. What made it newsworthy and gave the story legs was the fact that it was a leak. all of a sudden you have a story. At the same time you overcome the age old dilemma faced by all public companies – how to keep staff in the loop before you release price sensitive news that fundamentally affects them to the market. So a week later when Cisco announced details of the closure of its Flip Cam business and 550 redundancies, the market was waiting for the news and the internal audience had already been primed. I can say without fear of contradiction that in my long and distinguished career in Internal Communications I have never witnessed a deliberate or strategic leak of an internal memo. Sure, I’ve seen exaggeration on occasion, as witnessed just seconds ago with my use of the words ‘long and distinguished’. I’ve seen stuff leaked to the press accidentally and maliciously. But I’ve never seen an intentional strategic leak of an internal communication. So was this a strategic or a malicious leak?